I’ve got a rails site with an active comments section. For a couple of years I’ve been using the recaptcha gem by fellow tampa.rb member Jason Perry, and that’s mostly worked well. Recently we’ve been getting hit by spam from Russia which has been getting past the recaptcha filters. 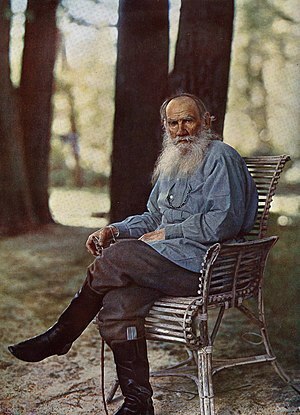 The spammer in question may or may not be Leo Tolstoy (pictured). In the meantime, I needed to add more protection to keep the discussions hammy. So, I turned to the akismet service from the WordPress folk, and the rakismet gem. To get it set up was fairly simple, with one gotcha. Note that I’m specifying the 0.4.2 version – this app is on rails 2.3.x, and the 1.0.x version of rakismet is rails 3 only. Next, sign up for an akismet api key over at akismet.com/. This service will run you $5/mo. You may have to map some fields from your model to the ones rakismet expects; details are in the readme. You may want to save the comments anyway and set a state flag to ‘spam’ or the like, so you can make sure valid comments aren’t getting unfairly flagged. This was written by matt. Posted on Tuesday, June 7, 2011, at 9:00 pm. Filed under rails. Bookmark the permalink. Follow comments here with the RSS feed. Post a comment or leave a trackback.